← Intel Today — A Belgian Watergate? On this day (Sept. 27 1905), the physics journal Annalen der Physik publishes Albert Einstein’s paper “Does the Inertia of a Body Depend Upon Its Energy Content?”, introducing the ‘infamous’ equation E=mc². 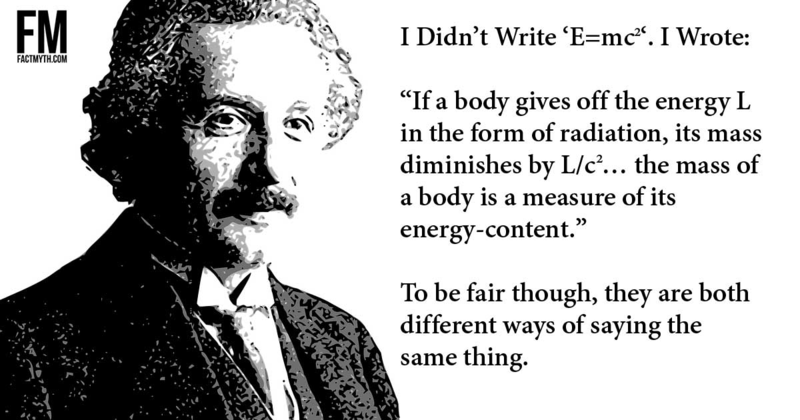 Einstein’s 1905 paper on mass-energy equivalence does not say ‘E=mc²‘. Roughly, the article states: “m=L/c²”. Change just one letter, and you will find out that this equation had been written many years before. Of course, Einstein did write the equation as ‘E=mc²‘ in the first issue of “Science Illustrated” in 1946 in the article “E=mc²: The Most Urgent Problem of Our Time”. This edition of Einstein’s Does the Inertia of a Body Depend upon its Energy Content is based on the English translation of his original 1905 German language paper — published as “Ist die Tragheit eines Korpers von seinem Energiegehalt abhangig?”, in Annalen der Physik.18:639, 1905 — which appeared in the book The Principle of Relativity, published in 1923 by Methuen and Company, Ltd. of London. Most of the papers in that collection are English translations by W. Perrett and G.B. Jeﬀery from the German Das Relativats prinzip, 4th ed., published by in 1922 by Tuebner. All of these sources are now in the public domain; this document, derived from them, remains in the public domain and may be reproduced in any manner or medium without permission, restriction, attribution, or compensation. The footnote is as it appeared in the 1923 edition. The 1923 English translation modified the notation used in Einstein’s 1905 paper to conform to that in use by the 1920’s; for example, c denotes the speed of light, as opposed the V used by Einstein in 1905. In this paper Einstein uses L to denote energy; the italicised sentence in the conclusion may be written as the equation “m=L/c2” which, using the more modern E instead of L to denote energy, may be trivially rewritten as “E=mc2”. And by the way, the theory was successfully put to the test in Hiroshima on August 6 1945. PS — One of my best memories is an evening with Lev Okun, a true genius who may well be the real father of the Russian thermonuclear weapons. Lev told me the very best joke about this equation. Every teacher should be ashamed! This was a splendid evening on the coastal city of a beautiful country that no longer exists. The war was coming, but people were still trying to pretend that everything was ok. I found myself alone with Lev Okun, the legendary Russian physicist. We ordered a bottle of wine and we talked, and talked. Little talk. Things like: “Could quark masses asymmetry generates a second-class induced tensor current in semi-leptonic interactions?” And a few other light topics. CP violation and neutrino oscillations. I told Lev why I believe that the neutrinos are Majorana particles. We still do not know about that 30 years later. Despite being one of the greatest physicists alive, Lev impressed me most by his humility. Today, I believe that it is quite logical. Bright minds are always honest minds. And honesty always brings humility. Only imbeciles are pretentious. Next Day — Lev is on Fire! You could see on the face of the British man that he was seriously offended. Boy, I can tell you that one never forget a moment of truth like that one. Lev asked the people seated at the table to answer 2 simple questions. Which of the following four equations was actually written by Einstein? And which one should we use to teach our students? This of course is completely absurd even if this equation is printed in all modern textbooks. Of course, the mass is a property of a particle at rest! There is no need for the zero in subscript! That one knocked down half the people at the table. Then came the second punch. Many of them had answered differently the two questions! And Lev simply pointed out the following evidence. This entry was posted in Fake News, Humor, Joke and tagged Fake News, Humor, Joke. Bookmark the permalink.